I was the first of the 23 students on my three-month field biology program in spring to get diarrhea. It was 2 a.m on our first night on an isolated island off the coast of Costa Rica when I woke up in my tent, scrambled for my headlamp, ran to the toilet and proceeded to lose five pounds in semiliquid form. It was only a matter of days before more faces turned pale and toilet paper became an important commodity. At first, we didn’t know how open to be about it, but after a while it seemed to be the only conversation topic at dinner — and occasionally the soundtrack, as the bathroom didn’t have a working door. When a group of biologists are stripped of modern-day distractions, they are forced to face their biology. To me, it seemed only natural. I’ve been pooping off trails for years now — it’s always invigorating to feel part of an ecosystem. The same way growing my own vegetables is idyllic and fulfilling. All week on the island, I had been learning about the complexity and majesty of this tropical ecosystem. I was trying to grasp how this plethora of brightly colored animals and plants grow and reproduce in such symbiosis. On one of our last days on the island, we all walked around with our field notebooks and wrote down questions. Questions, we were told, are the basis of biology — a field that, for the most part, comes back to the most fundamental question: what is life? As I wandered around the most tropical place I had ever been, I couldn’t help but ask the question: Why do humans poop in toilets? How are we overpopulated to the point that we have to ship in what we eat and ship out what we poop? What I really wanted to know was what makes us so different than this world around us. And if we really are trying to flourish, shouldn’t we just let ourselves be part of it? I looked around and saw more shades of vibrant and rich greens than I had ever before. My mom says something happens when you have kids. Poop suddenly isn’t so gross anymore, because you’re always changing your baby’s diapers. It’s just a part of life, and life becomes so precious and beautiful that something as simple as a working digestive system can put a smile on a mother’s face. The weeks went on, and although our stomachs grew stronger, the poop-talk never stopped. There was one girl who didn’t poop for four days and a boy who pooped five times on one hike. As part of my program, I conducted an independent research project, and to nobody’s surprise, I did it on poop. It was on a visit to Life Monteverde, a local coffee farm nestled in the mountains of Costa Rica, when I first saw an anaerobic digestor. Next to a pen with three pigs was a series of modest tubes leading to a large, white, plastic tank. 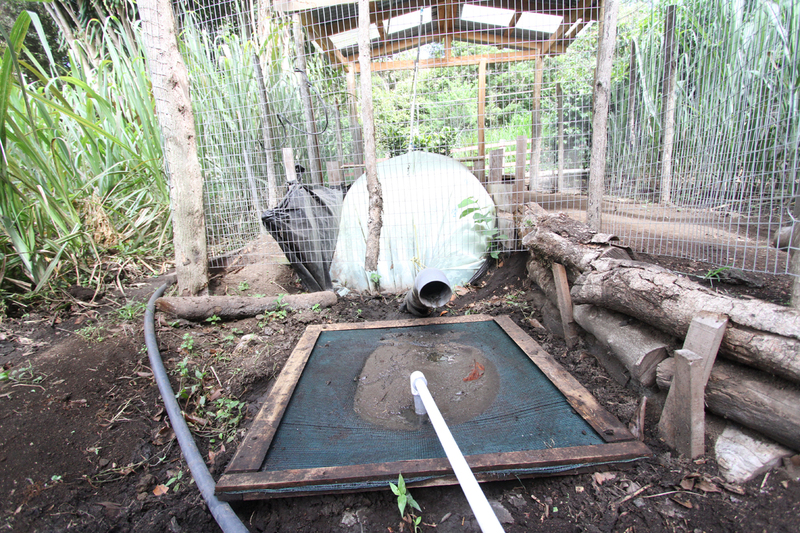 Guillermo Vargas, one of the farm’s owners, explained that anaerobic digestion is a process where organic matter — in this case, pig poop — is deprived of oxygen and broken down by microorganisms. The organic matter has two byproducts: methane, which is used as fuel to run the stovetop, and digestate, which can be used as a fertilizer. I couldn’t stop thinking about the anaerobic digestion system for the rest of my visit. How incredible that one could simply spend about $500 for a system that uses livestock manure to power the kitchen and serve as an alternative to synthetic fertilizers. Plants need healthy, nutrient-rich soil to grow. In the short term, the application of synthetic fertilizers supplies plants with the necessary nutrients. But these added synthetic nutrients can end up posing a toxic threat to aquatic or groundwater ecosystems. The anaerobic digestion system was a surprisingly simple yet potentially powerful way to keep energy and nutrients in the farm. 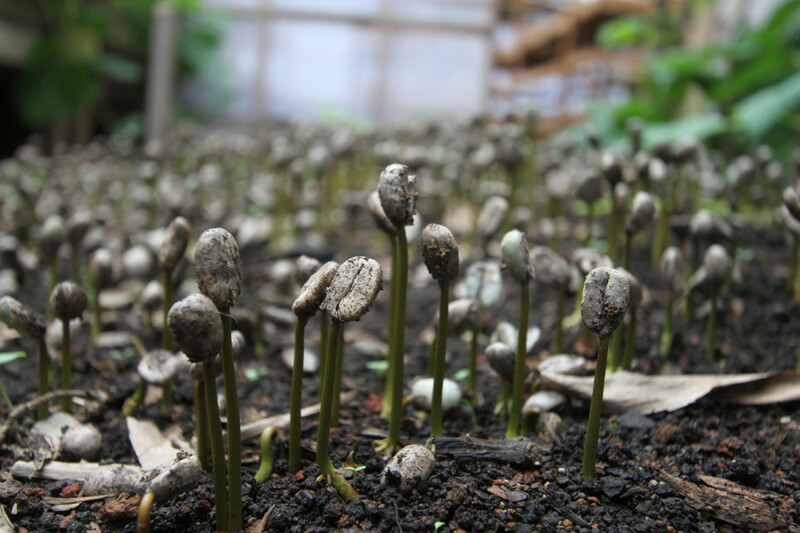 I conducted an experiment in which I compared the effects of four different organic fertilizers on the growth and development of coffee seedlings over a 10-day period in the greenhouse of this magical coffee farm in the mountain town Canitas. I compared coffee compost, goat-manure compost and two different concentrations of digestate from the anaerobic digestion system using pig manure. In order for organic farms to produce healthy and bountiful yields of crops with organic fertilizer, it is important to know the amount and effect of different concentrations of added organic material to soil. For the next few weeks, I was covered with soil. I befriended some incredibly knowledgeable and kind farmers. Guillermo became a mentor to me and taught me that the concept of profit in agriculture is not money but sustainability. We only truly profit if we give in to the complexity of nature. My results showed that the digestate had important nutrients for coffee-seedling growth. I thought a lot about the power of poop. Every delicious cup of coffee I drank or fried plantain I ate on the farm was heated by the methane. This small organic farm was fueled by pig manure—a small model for possible change. Maybe anaerobic digestion systems could be installed for entire cities! I moved directly from Costa Rica to New York City, and people joked that it was a different kind of jungle. I sat in the crowded subway and closed my eyes. I pretended I was in a rushing river. I looked around the streets and saw only concrete and no soil. No basis of life. What happens when we flush the toilet has become a mystery. I know it definitely did not used to be this way, and I also know cities used to smell a lot worse. But wherever it goes, poop doesn’t just disappear. The choices we make, whether we are on an organic farm or in a metropolitan city, return full circle to this planet. I don’t mean to gross you out. Well, maybe I do. But that’s because it’s important. It shouldn’t have to be a surprise that we are in a system. Being connected to our bodies means we should know what we put into them, as well as what comes out. While pooping on the street in New York City or Berkeley is disgusting and a health hazard, it is definitely more natural than concrete-covered soil. I had been in New York for two months when I noticed that a last remaining infected insect bite on my leg began to move. “I don’t want to scare you, and we can take care of it, but it’s a parasite,” the dermatologist told me. After taking pictures and excitedly showing her associates something they hadn’t seen since medical school, she explained it was a larva that lives in feces of smaller animals and can crawl into the upper skin layer of humans. “Have you been around soil recently?” she asked.